Remember my bridal showers? Specifically, the one in my hometown of Halifax? I was so grateful and overwhelmed to receive so many wonderful, thoughtful shower gifts, but my mother’s really stood out. She is one of the most thoughtful people I’ve ever met. Her gifts and surprises leading up to my wedding were filled with nostalgia and special meaning, and this particular shower gift was simply perfect. My mother’s mother, who I called Grammie, passed away suddenly when I was just two years old and my mother was 32 – on the second anniversary of my baptism, of all days. I have very few memories of her, but I do remember how difficult it was for my mother. I also remember that Grammie was a wonderful cook and homemaker. My mother inherited many things from Grammie, but my whole life she told me her recipe cards – in Grammie’s handwriting – were her most cherished possession. My mom grew up in the kitchen with her mother, taste-testing and helping and learning. There were recipes cards that had been used dozens of times, covered in flour, chocolate, grease and fingerprints. They held the most special memories. She then spent weeks hand-writing recipes cards of all our family’s favourite recipes, passed down from Grammie, my great aunts, friends of the family and my paternal grandmother, Nan-Nan. Among those recipes were many I grew up eating – beef bourguignon, strawberry-rhubarb pie, blueberry buckle and the best chocolate chip cookies. There were dozens of recipes I’d long forgotten about, too. This salad was among those recipes cards. 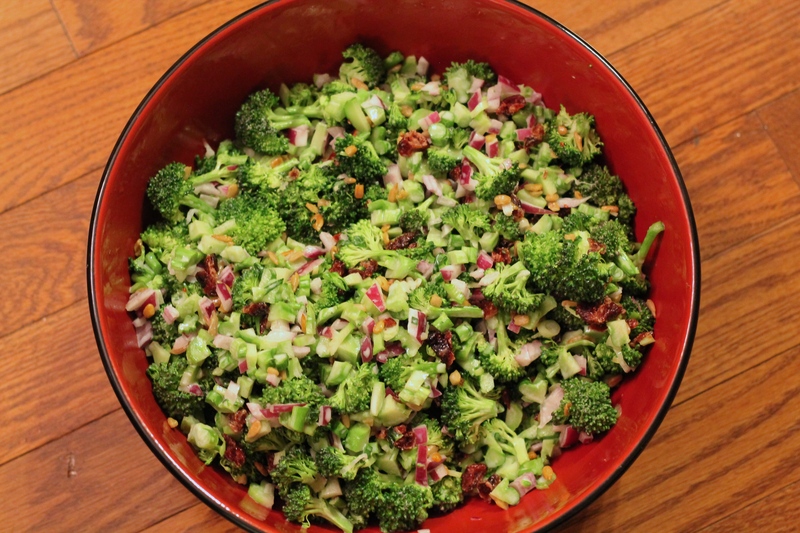 It was one of the salads my mama would throw together for potlucks and barbecues at a moment’s notice. I’ve probably eaten it more times than I can count, and it’s always a group favourite. The best part is that you can adjust the ingredients to suit your tastes – for example, we don’t love raisins, so I used dried cranberries a few times. I’ve also added chopped bell peppers and used white or green onion instead of red. My hope is that – eventually – I can make all the recipes my mother passed down to me, but there’s a lot – time will tell! Mix mayo, sugar and vinegar in a small bowl. 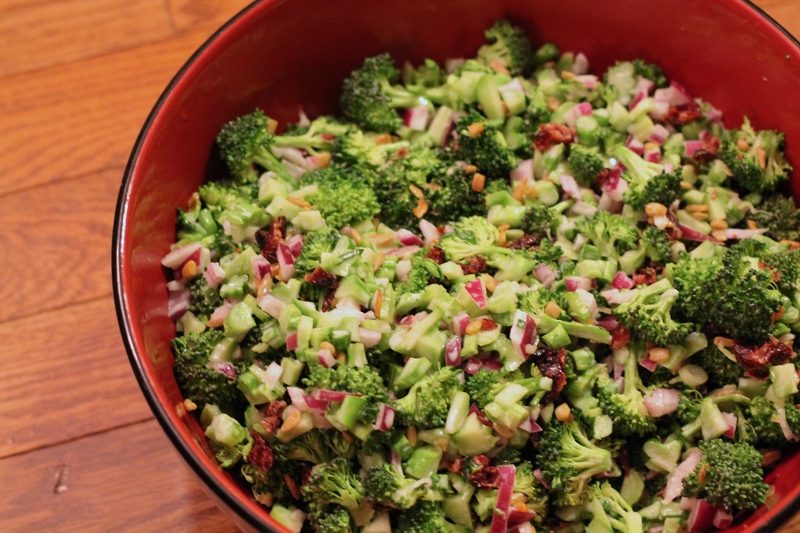 Pour over chopped broccoli in a large bowl, and add other ingredients. Stir, coating everything evenly. Serve immediately. If you must wait, refrigerate and don`t add sunflower seeds until the last minute. The Domestic Blonde Website Redesign!